Have you heard the above conversation in any sort of iteration over the past fifteen years? If you haven’t, then you’ve probably been avoiding superhero films, and the vast majority of films that populate the theaters nowadays. That’s fine. You can be a curmudgeonly old cinephile about the influx of CGI-riddled explosion-fests if you want, or you can just take it in stride. There have always blockbusters for the common masses, just like there will always be indie films for the cinephiles. I myself go back and forth on the superhero genre. I’m never vehemently opposed to seeing one of these films, but simultaneously it’s been a very long time since I’ve been excited for a superhero film. When I saw the trailer for “Shazam!”, I must admit I was surprised. DC has had far more misses than they have had hits, and this lighthearted superhero flick looked like a huge change of pace for the notoriously dark and brooding DC universe. I was intrigued, but content to wait to see it on video… and then a buddy asked if I wanted to see it opening weekend, and I had nothing going on at the time, so here we are. After foster kid Billy Batson (Asher Angel) is transferred to another foster home after running away again, a Wizard (Djimon Hounsou, “Serenity”, “Gladiator”) takes him to a mysterious realm and grants him powers to turn into the superhero Shazam (Zachary Levi, “Tangled”). 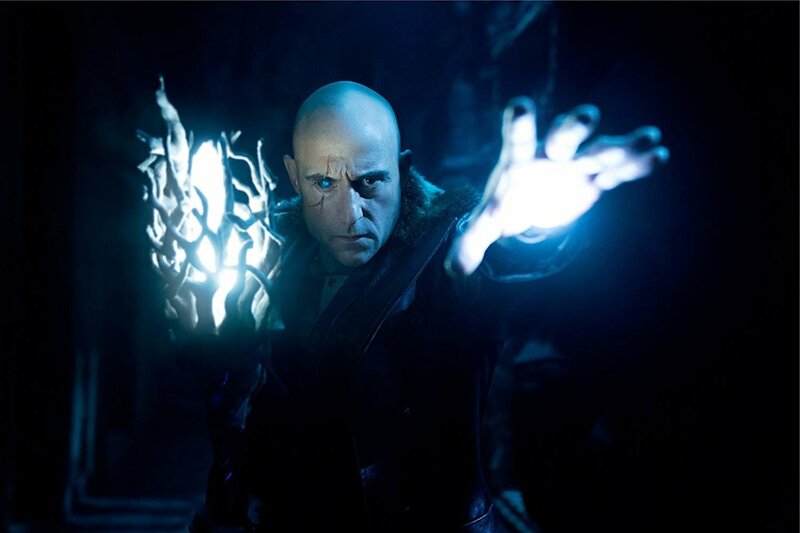 Meanwhile, Dr. Thaddeus Sivana (Mark Strong, “Sherlock Holmes”), a man whom, years ago, was visited by the same Wizard, and since that time has been seeking the power, finds a way into the realm and finds powers of his own. This is not a bad movie. In fact, I’m sure 90% of the people that see this film will find it very enjoyable. I found it to be pretty entertaining for the majority of the movie. The problem is that I was never, really, truly surprised by anything that happened. I have seen everything this movie has to offer me a thousand times before; only the superhero was wearing a different suit. This movie feels like every origin story ever. That is its biggest flaw, and ultimately the reason I gave this movie such a middling review. Aside from the fact that this film doesn’t really break any new ground, it’s also two hours and twelve minutes long. I’m all for a long movie, if that length is earned. This movie does not really earn its length. There are some funny bits, there are some heartwarming scenes, but there was plenty of stuff that could’ve been trimmed. There are some good parts. I like that Billy Batson lives with a foster family, and I like the way that foster family is depicted. Of all the other foster kids in the family, Billy spends the most time with Freddy Freeman (Jack Dylan Grazer, “It”). The relationship the two form is entertaining to say the least. Perhaps the best part of this movie is watching Freddy’s reaction to Billy’s transformation, and the way the two of them figure out Billy’s powers together. As far as what the scenes are actually showing us, it feels like something we’ve seen before, but it’s viewed with an overenthusiastic sense of childlike wonder. I think Zachary Levi is really likeable as Shazam, though I honestly felt that by the time this film ended the little-kid-in-a-big-superhero-body joke had kind of run its course, and I grow nervous at the thought that this film will undoubtedly get a sequel. I don’t think that one-note joke can sustain another entry. Superhero films have come a long way in the last twenty years. Look at one of the first superhero movies that really kicked off the superhero craze: Sam Raimi’s “Spider-man” (I know “X-Men” came before, but “X-men” doesn’t really have a good origin story aspect). Raimi’s “Spider-man” pretty much has every quality that this film has: a goofy outcast in high school that gets picked on by bullies, an inciting incident that gives them powers, a training montage, some mid-level baddie fights, and then we finish it off with a fight with a guy who might actually do some damage… It’s been decades since that film, how many freaking times do we need to see this exact story? I’m tired of it; give me something new. At least Marvel, when approaching their latest films, have started to branch out into different subgenres. Unfortunately, DC is still really struggling to get their cinematic universe off the ground. I know I ragged on this movie a lot, but it is probably the second-best DC movie out there (second to “Wonder Woman”, though I still haven’t seen “Aquaman”). It’s still nothing all that special, but at least it’s a step in the right direction, away from the dreary world of Zack Snyder. If you’re a huge fan of superheroes, then I can almost guarantee you’ll like this movie. If you’re a casual fan of superhero films, then just wait to see this on Netflix. If you don’t like superhero films, then why are you reading this review?